Mary is a retired nurse who continues to demonstrate the spirits of caring and compassion that are the hallmarks of her former profession. For us at The Ottawa Mission, Mary’s kindness shines through in two wonderful ways. After taking a tour of The Mission a couple of years ago, Mary decided to become a monthly donor. She learned a lot during the tour. As Mary says, “What struck me was how clean and well-organized the shelter was. And the people were so kind and friendly.” Mary also discovered that there is much more going on at The Mission than just providing food, shelter and clothing – like job training, on-site medical and dental care, and housing support services to name a few. For Mary, being a monthly donor is easy and convenient, and since The Mission operates 24/7, 365 days a year, she knows this is the best way to spread her contributions over the year to help keep programs operating all year long. Mary’s second act of generosity is very tangible and meaningful to many of the people we serve. 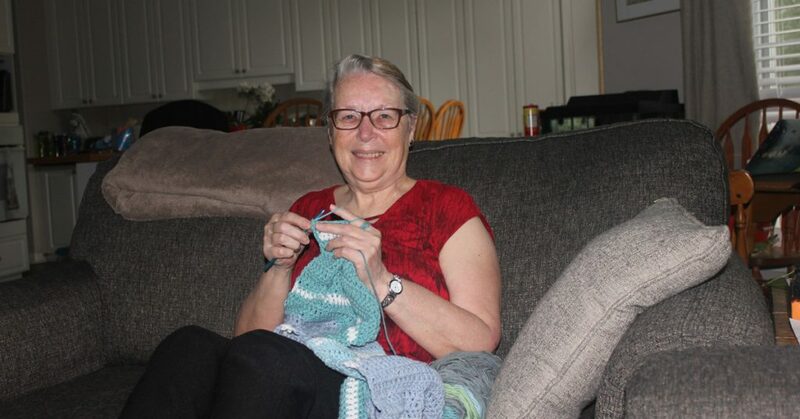 She loves to crochet and, as the cold weather approaches, she sends us gifts of hats, scarves and blankets that provide the wonderful gift of winter warmth to people in need. This year, despite ongoing health issues, Mary intends to keep this tradition going as much as she can. To Mary, and all of our generous donors and supporters, you are indeed making a difference. Thank you.